Cerodontha (Poemyza) pygmaea (Meigen, 1830); Spencer, 1990. Host specialization in the world Agromyzidae (Diptera) : 354, 355, 356, 369, 370 (fig. 1386). Leaf-mine: Normally several larvae feed together. Pupation in the mine (Spencer, 1976: 198). Nowakowski (1973) gives details of the larva. Posterior spiracles each with 3 bulbs (Spencer, 1976: 198). 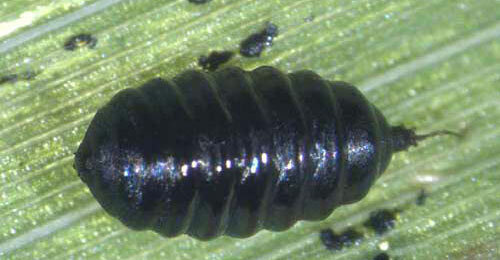 Shining black (Spencer, 1976: 198), larvae individially anchored within the mine with a silken thread attached at their rear end (Bladmineerders van Europa). Comments: The larvae of C. incisa and C. pygmaea are easily discriminated. The opposite holds for their pupariria, which is unfortunate because they are found frequently (much more often then the larvae) and because they are quite conspicuous. They are deep black with a strong violet or blue metallic shine; they are lying in the mine, not in puparial chamber, but anchored to the inner wall of the mine by means of a thread. Often several pupariria are found together, and then frequently the anchor wires are fused near the point where they are attached to the plan (Bladmineerders van Europa). De Meijere (1928) and Hering (1957a) state that the distal margin of the common base of the rear pupariria is straight or convex in incisa, concave in pygmaea. This must be related to the size of the warts at either side of the rear spiracula, small in incisa, large in pygmaea. In practice, however, I find this character difficult to use. A second character invoked by them is that the intersegmental constrictions in incisa are roughened by tiny scalelike irregularities, while those in pygmaea have minute transverse corrugations. I have the impression that this is not reliable (Bladmineerders van Europa). Time of year - mines: (May) June-September (October) (Bladmineerders van Europa). Time of year - adults: June-August. Distribution in Great Britain and Ireland: Widespread and common in Britain including Dunbartonshire (Bonhill) (Spencer, 1972b: 104), Warwickshire (Coventry, Holbrooks) (Robbins, 1991: 137); Cambridgeshire, East Gloucestershire, Glamorgan, Huntingdonshire, North Hampshire, Northamptonshire, South-west Yorkshire, Surrey and Westmorland (NBN Atlas). Distribution elsewhere: Widespread and frequently common in much of Europe including Denmark, Sweden, Finland (Spencer, 1976: 198), The Netherlands (Bladmineerders van Europa), Belgium (Scheirs and de Bruyn, 1992), Germany (Spencer, 1976: 554), Austria, Canary Is., Czech Republic, Estonia, French mainland, Hungary, Italian mainland, Latvia, Lithuania, Madeira, Poland, Slovakia, Spanish mainland and Yugoslavia (Martinez in Fauna Europaea). Also recorded in Alaska and Canada (Spencer, 1976: 198).